I’m thinking of doing a series of articles featuring one main scent or ingredient, and I decided to start with the one I’m currently obssessed with, which is cocoa! 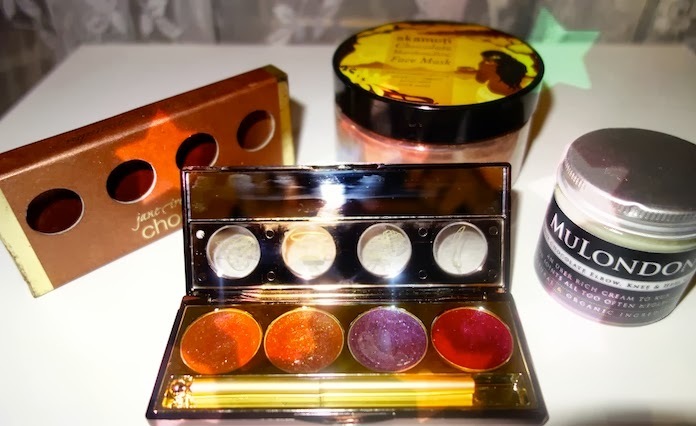 Being quite a chocoholic (I do only eat dark chocolate though), I’m happy to see that I can also satisfy my chocolate cravings through beauty products. The world’s most edible cream! Smells like white chocolate, with a hint of Vanilla as well. I literally have to refrain myself from eating it and it’s possibly one of my best purchases of this year! Made with only pure ingredients, it’s the ultimate body cream for a nice pamper session. It’s rich, cream and quickly absorbed by the skin. Specifically made for extremely dry areas, such as knees, heels and elbows, it leaves your skin incredibly smooth. The title is self-explanatory, right? Combined with Vanilla beans and marshmallow Root Powder, it’s one of my all-time favorite masks. It’s pure bliss. Skin feels clean and renewed. Since using it, I’ve noticed less redness on my face and less breakouts. From the packaging to the flavours, everyting reminds you of chocolate. 4 chocolate-y shades, with flavors like blood orange/dark chocolate, Coffee espresso, Very Berry and Chili Pepper. It’s my go-to lip palette to start off the Christmas festivities. The glosses are shimmery and perfect for luscious lips. They are incredibly moisturizing and feel soft on the lips. Because of the chocolate-infused flavours, the lipglosses leave a sweet taste on your lips. Three incredible and mood-lifting products! I sincerely hope you are not too hungry now 😉 Have you tried any of these products? The only thing I have beauty related that is chocolate flavored, I just received. Acure Dark Chocolate + Mint Argan Oil Lip Balm. The JI lip glosses look nice! I also have the MuLondon Cream and I love it!